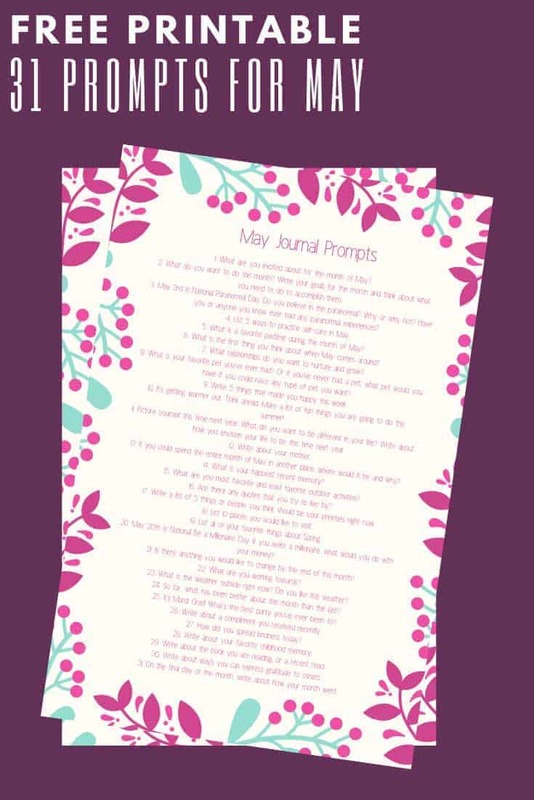 Download this free printable that gives you 31 May journalling prompts. Use them in your bullet journal or a notebook to inspire you to write regularly. The bullet journal inspiration posts I share are always super popular. But of course bullet journals aren’t just for weekly spreads and trackers. After quite a few reader requests it seems it’s time to put the “journal” into bullet journalling. If you struggle with staring at a blank page and trying to figure out what to write about then journal prompts can help you. So today I’m sharing 31 May journalling prompts to inspire you. You can use them to help you journal every day during May, or you can just pick and choose the ones that make you think. 1. What are you excited about for the month of May? 2. What do you want to do this month? Write your goals for the month and think about what you need to do to accomplish them. 3. May 3rd is National Paranormal Day. Do you believe in the paranormal? Why or why not? Have you or anyone you know ever had any paranormal experiences? 4. List 5 ways to practice self-care in May. 5. 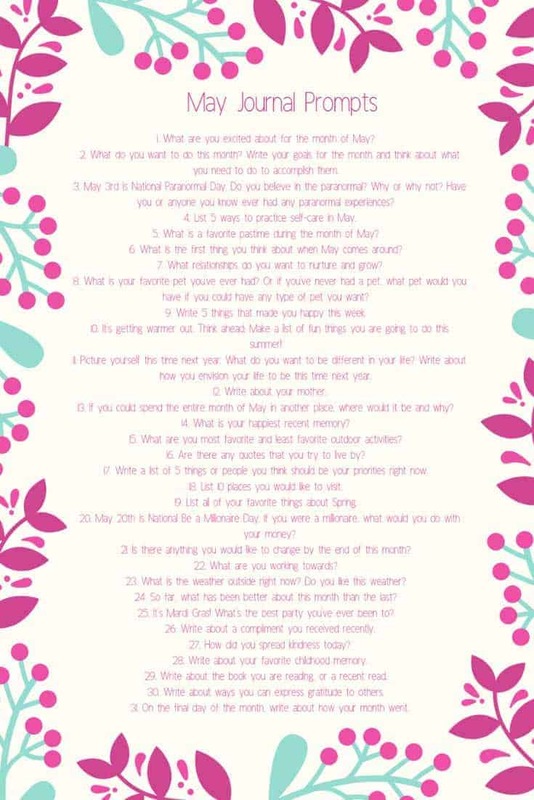 What is a favorite pastime during the month of May? 6. What is the first thing you think about when May comes around? 7. What relationships do you want to nurture and grow? 8. What is your favorite pet you’ve ever had? Or if you’ve never had a pet, what pet would you have if you could have any type of pet you want? 9. Write 5 things that made you happy this week. 10. It’s getting warmer out. Think ahead: Make a list of fun things you are going to do this summer! 11. Picture yourself this time next year. What do you want to be different in your life? Write about how you envision your life to be this time next year. 12. Write about your mother. 13. If you could spend the entire month of May in another place, where would it be and why? 14. What is your happiest recent memory? 15. What are you most favorite and least favorite outdoor activities? 16. Are there any quotes that you try to live by? 17. Write a list of 5 things or people you think should be your priorities right now. 18. List 10 places you would like to visit. 19. List all of your favorite things about Spring. 20. May 20th is National Be a Millionaire Day. If you were a millionaire, what would you do with your money? 21. Is there anything you would like to change by the end of this month? 22. What are you working towards? 23. What is the weather outside right now? Do you like this weather? 24. So far, what has been better about this month than the last? 25. It’s Mardi Gras! What’s the best party you’ve ever been to? 26. Write about a compliment you received recently. 27. How did you spread kindness today? 28. Write about your favorite childhood memory. 29. Write about the book you are reading, or a recent read. 30. Write about ways you can express gratitude to others. 31. On the final day of the month, write about how your month went. I’ve put all 31 writing prompts into a free one page printable which you can download here. If you like to color to relax you can download this coloring journal version which has the daily journal prompts on a dot grid page with a pretty border for you to color in. If you don’t want to print it yourself there is a pre-printed version for sale on Lulu.